2CELLOS, music’s most electric and dynamic instrumental duo, go to the movies for their new Portrait/Sony Music Masterworks album Score. Bringing 2CELLOS’ game-changing sound and style to the most popular melodies ever written for classic and contemporary movies and television. 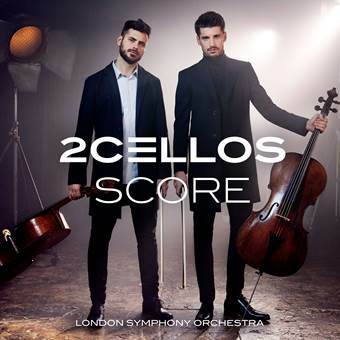 An international sensation since their unique video version of Michael Jackson’s “Smooth Criminal” rocked YouTube with millions of hits in 2011, the Croatian cellists Luka Sulic and Stjepan Hauser have created three high-energy albums for Sony Music Masterworks. Score finds them exploring a more traditional sound-world. Joining them here – to provide the ideal aural backdrop to their virtuosity – is the London Symphony Orchestra, with conductor/arranger Robin Smith at the helm. Sulic and Hauser also co-produced Score with Nick Patrick (Jackie Evancho, Il Divo, Placido Domingo). 2CELLOS were the first instrumentalists to be featured on Glee. They have also appeared multiple times on The Today Show and The Ellen DeGeneres Show in addition to The Tonight Show, The Bachelor Live Wedding Special among others. Their self-titled debut album, IN2ITION and Celloverse are available on Sony Music Masterworks. Disclosure: The bloggers participating in this event have NOT been compensated for this post. Networking Perks provides honest opinions, beliefs or experiences on products reviewed. Networking Perks is NOT responsible for prize fulfillment, Sony Music will be sending the prize directly to the winner. This event is in no way associated with, sponsored, administered, or endorsed by Twitter, Google, Pinterest, Facebook or any other social media. If you have any questions or would like help in promoting your own product please contact me at Joie@NetworkingPerks.com . The disclosure is done in accordance with the Federal Trade Commission 10 CFR, Part 255 Guides concerning the use of Endorsements and Testimonials in Advertising. They tour world wide and did a theme music medley for Game of Thrones. I learned they’ll be in Milwaukee in October. I’d really like to see them.